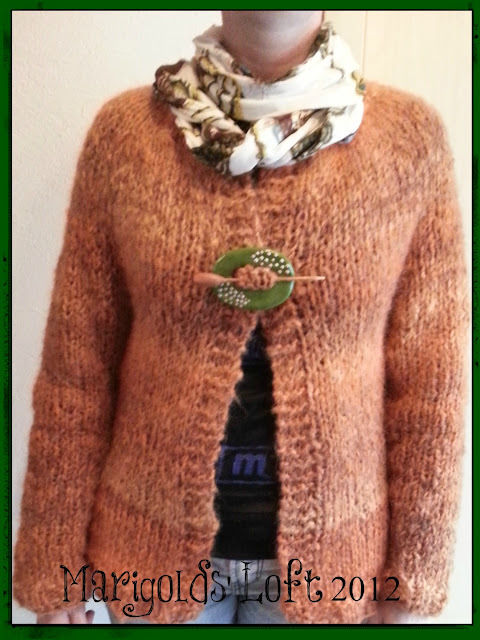 Orange and finished :) My Quick Knit Cardie is done, but I have yet to block it. The cowl is just about ready but not off the needles right now, so I will have to show that next week. Sorry, the photos are a bit bright and a bit fuzzy.... Will take another one with the cowl and a real camera next week!! 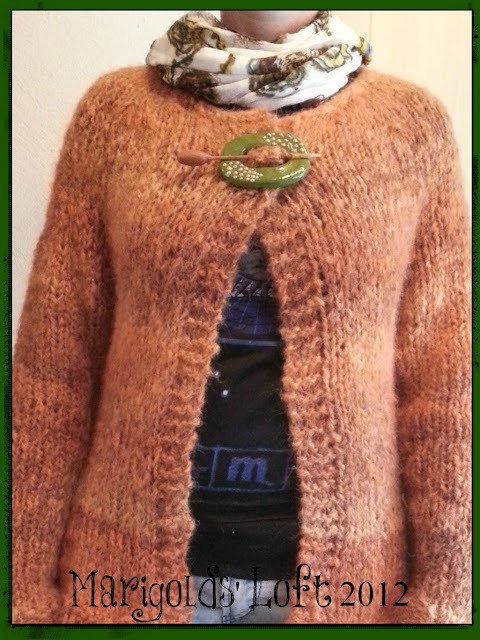 If you are interested in making the scarf pin I have on my cardigan you can find out how I made it here. I have used a different pin with my cardie today, made it with a kebab stick, clumped a bit of the Miralight* clay on the end, allowed it to dry and painted it brown. Tomorrow I will be posting about a wonderful hike I had yesterday, up above the clouds - so cool!! I will be sharing this post over with my link ups. Thanks, I agree :) Your bag has been sent to the PO. You should receive it early next week. I like that sweater a lot. I know it does sound a bit odd LOL, but finishing a cardi in 3 days is pretty quick don't you think? Great sweater, Natalie. It looks comfy and the color is very beautiful! And your pin looks fab on it! Thanks so much, it is wonderfully warm, I was a bit sceptical because it has polyester and acrylic inside of it, but it is still wonderfully squishy and comfortable.